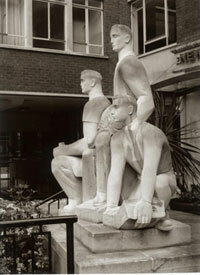 Wilfred Dudeney RBS was one of the key figures in the British revivalist sculpture movement of the post-war years. Perhaps his most important public work, Three Printers (1954) was saved by Christopher Wilson from destruction. “Once left to languish in a demolition yard, the only public monument to newspaper-making in Britain has been given a permanent home at the Goldsmiths’ Company in the City. “Three Printers was commissioned by the Westminster Press group in the mid-1950s, when the company moved its headquarters to a square off Fleet Street. The title of the piece is a misnomer, as Dudeney sought to represent several aspects of newspaper-making in his triptych: a news boy, for sales; a printer, holding a ‘stick’ for carrying metal type on the print floor; and an editor or proprietor. “After the national newspapers moved East in the mid-1980s, the statue was consigned to a demolition yard in Watford. It was discovered there by former Fleet Street columnist Christopher Wilson. He brought it to the attention of the Goldsmiths’ Company, which, as freeholder of the New Street Square site, had unknowingly inherited the work. 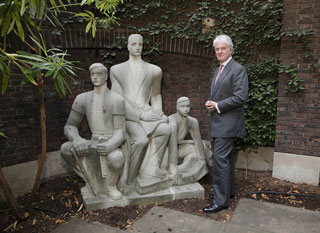 The re-sited Three Printers was unveiled at a ceremony in the Goldsmiths’ Company gardens in the City of London in the autumn of 2009. The gardens are publicly accessible.